Piotr Czekierda is the award-winning manager, entrepreneur and business consultant. He specializes in i nnovations, startups, and R&D sector. His extensive professional experience includes both the creation of innovative products, organizational leadership as well supporting professionals in their professional and personal development. Piotr studied political science and philosophy at the University of Wroclaw, business at IESE Business School in Barcelona (IFP) and creative writing at the Institute of Literary Research of the Polish Academy of Sciences (IBL PAN). He also served as a mentor at the MIT Enterprise Forum Poland. 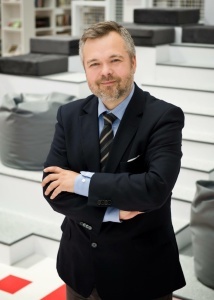 Piotr Czekierda was nominated by the Gazeta Wrocławska Polska The Times on the Effective Manager 2015 Plebiscite. He has extensive experience of international cooperation, among others, in the USA, France, Italy, Germany, Malta, Lithuania, Slovenia, Belarus, Israel. Piotr currently serves as the Representative of the Board of KGHM Cuprum for the Acceleration Programs. He is also a Chairman of the Supervisory Board of the Collegium Wratislaviense. Besides professional work, Piotr is also involved in cultural, educational and social activities. He lives together with his wife and four children in Wroclaw.